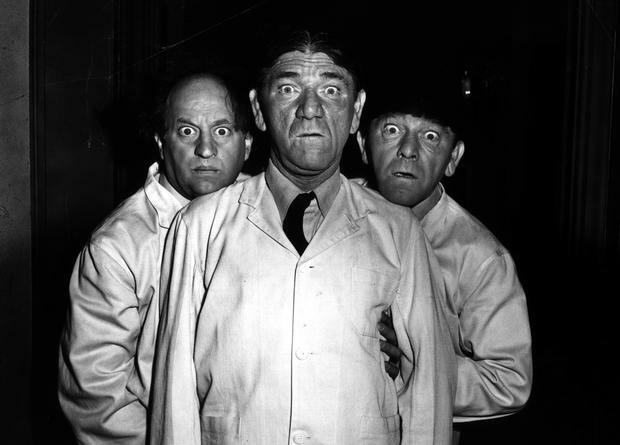 Into the 1950s, The Three Stooges’ producer-director Jules White was working at maximum efficiency on their behalf at least in terms of quantity rather than quality. Reputedly he could even cobble together an entire short film in just one day by brazenly cannibalising footage from other films and then shooting connective scenes, often featuring the same actors, studio sets and costumes to cover the gaps. As one might imagine, this only leads to impressive output numbers, indicating a dearth of decent material - which will become glaringly apparent in Creeps (1956). Before we get to that final horror-comedy of the team, White did occasionally make an entire film from scratch and in the case of 1953’s Spooks he had a very good reason. 1953 was the year that the 3D format became a big box-office craze. Edwin H. Land’s particular version of 3D (or stereoscopic vision to be exact) was pioneered back in 1929 as an invention to dim overly-bright car headlights. It used a layer of filtering crystals that only allowed certain light waves to pass through. He discovered that his technique could also create three-dimensional film images by superimposing two images onto the same screen via separate polarising filters and displayed by two projectors. Special eyeglasses featured two subtly different polarising filters that gave the viewer a slightly varying perspective on the scene through each eye, which appears to give what’s on the screen the impression of depth and solid form. When 3D took off in the 1950s, films were either made in this process or filmed using the alternate Natural Vision method. April 1953 was the banner year for the new form. The Three Stooges’ studio Columbia got on board early with the stereoscopic film noir Man in the Dark. Later that month Vincent Price’s world of mannequins burned splendidly in glorious 3D colour (pioneering stereo sound as well) in Warner Brothers’ House of Wax, followed in May by battling cowboys and Indians spilling out into our popcorn in the siege western Fort Ti directed by the master of cinema gimmicks William Castle. Jules White saw a rising tide of quick profit and quickly rushed into production the world’s first 3D comedy short Spooks, getting it out just a few weeks after this. Spooks may have broken new ground in comedy presentation but the content by now was largely old-hat. Although White doesn’t recycle footage, he and The Ghost Talks writer Felix Adler contend themselves with reusing Stooges plots instead, albeit starting with the team in a line-up thrusting their disembodied bonces into the audience’s faces. The boys begin as partners in the Super Sleuth Detective Agency whose cynical advertising raises a smirk: “Divorce evidence manufactured to your order”. For some macabre reason their wall boasts an impressive display of medieval torture implements. The Stooges whip up their doorstep pie-giveaway ruse to scope out neighbourhood houses for clues. Their first home visit is a spooky domicile indicated by ghostly sighing wind on the soundtrack. Here is where the guys begin to make use of the stereoscopic in their slapstick, and once they start, it sets off a deluge of point-of-view gags. Moe gives Shemp, or rather us, a two-fingered eye-pop - which noticeably slows down the comic timing. In the meantime, inside the house, there’s a caged man-in-a-gorilla-suit (Steve Calvert) imprisoned by a mad scientist who is yet another graduate of that medical degree mill, the Van Dyke Beard and Glasses School of Medicine. This is Philip Van Zandt whose huge credit list included earlier better times such as Mr Rawlston in Welles’ Citizen Kane (1941). Likewise, Tom Kennedy whose characterful pugilist face as his lumbering manservant earned him over 300 screen appearances elsewhere alongside comedy greats like the Marx Brothers and Laurel & Hardy. They have abducted the lovely Mary Bopper (Norma Randall) in order to brain-swap her with said ape, name-checked Kongo after M-G-M’s 1932 jungle horror movie (see my review 22/3). I wasn’t kidding when I referenced the over-enthusiastic use of the new technology in this short. From here on, engaged in pitch battle with the scientist, a torrent of 3D tools are thrown as if was going out of style (which within a year it would be). A greater lethal arsenal is launched at our point of view than in Friday the 13th Part 3 - (I counted a hypodermic needle, knife, hatchet, scythe, a flame-thrower, a water-based extinguisher and a pitchfork – take that, Jason Voorhees). And that’s just the adult instruments. Two moments in the melee are interestingly rare, whereby Larry takes Moe’s place in beating up on Shemp for a change who is, come to think of it, markedly more submissive toward his basin-cut bro’ than in the days of The Ghost Talks. As pies are recruited for the flinging, Moe learns that the white-coated wack job is named after Stevenson’s famous schizoid: “Dr Jeckyl? We must Hyde!”. That gag is worth a flan in the face and by the end of the movie everyone gets one, including us in more ways than one. 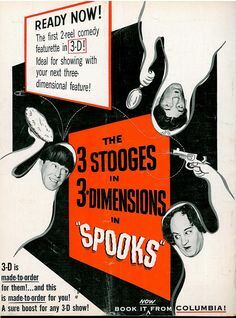 Though it was shot in 3D, Spooks is a one-dimensional re-tread of the Stooges’ back catalogue, enlivened only by the crude novelty of in-your-face slapstick. Jules White hastily assembled a second stereoscopic cash-in for the boys, Pardon My Backfire, which came out in August. By 1954, 3D was no longer all the rage. Hitchcock’s Dial M for Murder was released this way and The Creature from the Black Lagoon did well enough in the pool to spawn one of its two sequels, Revenge of the Creature (1955) in 3D, yet it proved a brief phenomenon. From a highpoint of over 5000 American cinemas projecting in the format, the demand dwindled partly due to sheer economic inviability. Cinemas had to customise their projectors and pay extra for the two screening prints necessary. Meanwhile, ever on the lookout for the next big thing to tempt Joe Public from their couches, the new widescreen vistas of Cinerama, Fox’s Cinemascope and Paramount’s (short-lived) Vistavision took off, granting viewers a broader canvas requiring less hardware. Spectacle without spectacles. Incidentally, for technical buffs, Spooks took advantage of widescreen development too as it was the first of their series to be shot using the more cinematic 1:85:1 Columbia house ratio instead of the usual squarer Academy Ratio of 1:35:1.